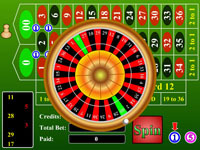 This version of roulette has only a single '0' on the wheel and is missing the '00' that is typical in American casinos. In Europe, it is common to see a roulette wheel with a single '0' as this one has. It is much less common in American casinos. 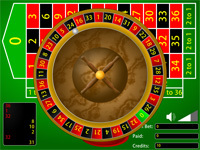 A typical American Roulette table typically has both a '0' and a '00' pocket on the wheel. This greatly increases the house advantage on the roulette wheel. This version of Roulette has only a single '0' and is missing the second '00' which would typically be found in an American casino. The odds of this table are similar to many that would be found in European casinos. 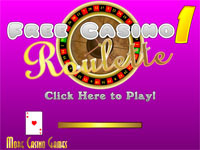 This is the original version of Roulette that appeared on the Casino Games & Slots web site. For use with older versions of the Flash Player.